Kim Kardashian and her sisters were invited by Pepsi to host a little charity Christmas dinner over the holidays. The Kardashian sisters brought clothing and food that is being donated to those who need it, and then Pepsi took care of the rest. 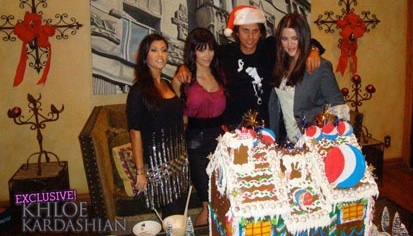 Kim Kardashian, Khloe and Kourtney helped make Gingerbread Houses and the Pepsi Gingerbread House even had their names on it. Visit here for more photos!